(Nashville, Tenn. – May 18, 2016) — The International Parking Institute (IPI) has singled out two university parking organizations, Texas Tech University Transportation & Parking Services and the University of Texas at Austin Parking & Transportation Services, as its 2016 Parking Organizations of the Year. The annual award, announced at IPI’s 2016 Conference & Expo in Nashville, Tenn., May 17-20, recognizes public or private parking organizations, departments, consultants, suppliers, and commercial operators that exceed expectations and meet extremely high industry standards. During one weekend in November 2015, the Texas Tech University campus hosted the first men’s basketball game of the season, a conference volleyball game, the first round of the NCAA soccer tournament, the Lady Raiders Basketball Education Day Game with 105 buses carrying 6,000 children, the final home football game with more than 55,000 fans, a press conference with more than 200 attendees, and 15 additional special events, along with the normal departmental operations on a campus with 35,000 students and 6,000 employees. Five years ago, this feat would have been next to impossible. Today, Texas Tech University Transportation and Parking Services (TPS) handles days like these with relative ease. Efforts to increase efficiency led to increased sales, greater lot utilization, less abuse, and higher and multiple revenue streams. The customer service focus led to informative media pieces about parking updates and programs. TPS is included on numerous campus committees because of the increased ease in working with the department. TPS is now known for its flexibility, openness, service, and efficiency. With a campus of more than 75,000, events bringing 100,000+ people in on a given day, a new medical school on the way, and only 90 full-time employees, University of Texas at Austin Parking and Transportation Services (UT-PTS) runs efficient, innovative, and dedicated operations to provide access and mobility. UT-PTS met this challenge by adding two garages in the past five years with another three currently underway. Along with adding EV charging stations in an older garage, UT-PTS is seeking green certification for those under construction. One of UT-PTS’s biggest pushes in recent years has been to improve cycling on campus. Its BikeUT program hosts auctions and runs The Kickstand, a bike hub selling supplies, loaning tools, and offering registration. They also oversee university fleet vehicles, run two auto shops and fueling stations, partially fund Campus Safety and Security, and even manage campus vending machines. 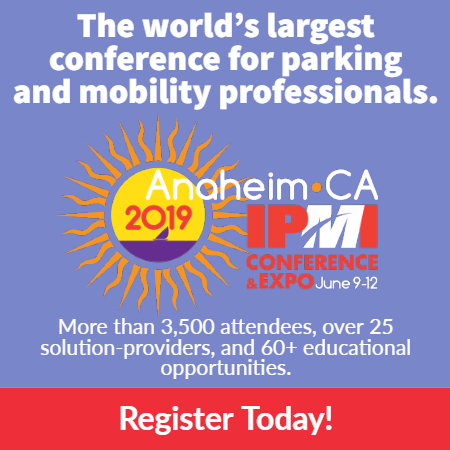 For more information about IPI, the largest association representing parking professionals and the parking industry, visit parking.org.